Manchester United face an uphill task if they’re to qualify for the Champions League semi-final. Ole Gunnar Solskjaer’s men fell to a 1-0 defeat to Barcelona, with Luke Shaw’s own-goal doing the damage early on. United, much to their credit, battled hard and pinned Barcelona back, but failed to register a shot on target. While Solskjaer and his coaching staff must devise a masterplan to unlock the Barca defence at the Camp Nou on Tuesday night, we run through five of the main talking points from the clash at Old Trafford. Lionel Messi can lull teams into a false sense of security. From the outset, the Argentine picked up the ball from deep positions. While United worked hard to close him down, his dart through their backline from a deeper position ultimately created the opener. Found by Sergio Busquets, his heavy first touch took him away from goal but he telepathically sensed Suarez lurking at the far post. His dinked cross allowed the Uruguayan to head it off Shaw and dent United’s hopes in just the 12th minute. It’s a lesson about Messi; a momentary lapse in concentration will allow him enough time and space to fashion a goal-scoring opportunity. He was subsequently quiet for the rest of the game but the 31-year-old did enough to leave his mark on the game and give Barcelona an away goal before the return leg at the Camp Nou. Barcelona, like Juventus and Paris Saint-Germain, set the tone early on. They dominated possession, playing short, patient passes to keep United on their toes. But United, to their credit, worked hard and gained momentum as the first half wore on. Scott McTominay and Fred pressed in midfield and the hosts found some joy out wide, with Ashley Young and Diogo Dalot finding themselves with time to cross. United’s response shook Barcelona. Busquets, lucky to still be on the pitch after receiving one yellow card from three bookable offences, looked off the pace and was uncharacteristically careless in possession. The Catalans are far from impenetrable, as evidenced by them shipping four last week against Villarreal. Gerard Pique looked assured as ever but Clement Lenglet was nervy while Nelson Semedo, a threat going forward, left space at the back. Solskjaer will expect a more assertive Barca performance in the Camp Nou but United are in better shape than they were after the first leg against PSG. This tie is far from over. Perhaps the only frustrating tactical decision from Solskjaer was deploying Dalot on the left, with Young on the opposite flank. While Dalot put in an admirable shift helping Shaw, Young was disappointing. The 33-year-old, so often a dependable operator, was erratic with his crossing, an area in which he has often excelled. Jordi Alba often offered Young time and space, but the United captain repeatedly failed to find his intended target when crossing. On the left, Dalot, clearly a very right-footed player, made forays forward only to cut back, a move which took the sting out of the attack. One can’t help but feel that the Portuguese teenager would have found more joy on the right. Quick and skilful, his drop of the shoulder has often been an effective tool in his armoury and, with Romelu Lukaku starved of decent service into the box, it felt like a missed opportunity. Twenty years ago, David Beckham only needed two crosses to Dwight Yorke to virtually kill the quarter-final tie against Inter Milan. Oh, how United could have used that combination here. Solskjaer, as one of the most natural finishers the game has ever seen, will have been disappointed with his side’s lack of cutting edge in the final third. United failed to register a shot on target at home in the Champions League for the first time since 2005 (vs AC Milan), with endless crosses failing to find heads and shots from the likes of Marcus Rashford and Fred lacking the accuracy to trouble Marc-Andre ter Stegen. It was also surprising that Pogba and Lukaku, two of United’s most shot-happy players, didn’t manage a single effort between them. But the most damning stat relates to this season as a whole: none of the current squad have scored a goal at home in the Champions League this season. Marouane Fellaini, who left in January, remains the only one to have done so. In other words, United have scored one goal – the Belgian’s stoppage-time effort against Young Boys – from 65 shots. Quite simply, that isn’t good enough. 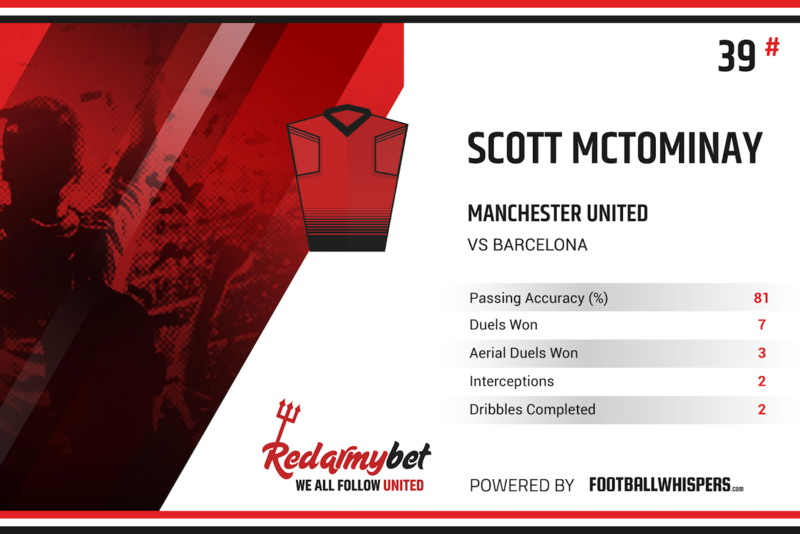 Barca dominated for long spells but McTominay, once again, can hold his head up high after a battling display in midfield. The young Scot, who recently scored his first goal for the club against Wolves, was brave and diligent up against Sergio Busquets, Ivan Rakitic and Arthur. Going forward, the 22-year-old was willing to take passes on the half-turn and tried to make quick passes out to the wing. He also created an opening for Anthony Martial late on, only for the Frenchman to take a heavy touch and allow Gerard Pique to intervene. The Scotland international’s rise to prominence is timely. With Ander Herrera seemingly off to PSG and Nemanja Matic fighting a losing battle against father time, he looks capable of taking up a regular starting berth in the United midfield. Although Solskjaer will presumably look for high-profile recruits in the summer, the outlook is a lot brighter now than it has been at times in McTominay’s young career.